Summer Camp Deadline is 1 Week Away! 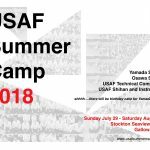 You are here: Home / USAF Latest News / Summer Camp Deadline is 1 Week Away! This is a friendly reminder that the deadline for registering for camp and reserving a room at the discounted rate is 1 WEEK AWAY – FRIDAY JUNE 22nd. Please spread the word, and forward to your dojo members and friends.